Mount Blair Walk, Glenshee, Glenisla, Corrie Vanoch. Sitting on the dividing line between Angus and Perthshire, Mount Blair is a perfect hill for a summer evening stravaig, or a short winter walk. 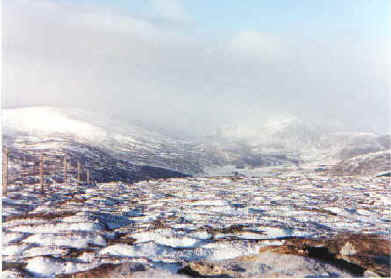 At 744 metres in height, it is often overlooked by hikers driven on by the magnetism of the Munros. 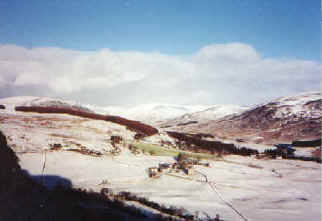 But Mount Blair's isolated position means that it makes a perfect viewing platform for the bigger hills of Glenshee to the north. Its relative isolation means that it can also catch the full force of the wind and this adds to the experience, especially in winter. We made the trip up Glenisla in mid-December to tackle the peak and, although there was a dusting of snow on the roads, we arrived at the small car park near Altaltan unscathed. We shouldered our packs and headed along the track leading from the car park and onto the hillside where we were greeted by a young deer which scampered off up the slopes with a flash of its white tail. Clambering over a metal gate and into a small copse of trees, we decided to follow the deer's fresh footprints in the snow reckoning she would know the best route up the hill. Unfortunately we lost her trail in a large patch of heather robbed of its winter blanket by the wind and decided instead to make a direct ascent of Corrie Vanoch in order to gain height as quickly as possible. Climbing hills in this fashion has its advantages and disadvantages - it can be extremely exhilarating but if you aren't fit or properly warmed up then it is best to take a more leisurely approach. The jagged slopes of Corrie Vanoch make for some excellent scrambling and, once into a steady rhythm, we soon hauled ourselves up onto the small plain below the lower outlying top. We now had a grandstand view of the narrow tower of Folda Castle to the north east, the valley cut by the River Isla and the mountainous region behind it. Glas Maol (see our Mountains section) was just visible through the wispy cotton wool clouds drifting towards the Caenlochan Forest. From here we were able to rejoin the path which curls its way up towards the large cairn which, at 653 metres, is nearly 100 metres short of the main summit to the south west. Our day was fairly clear but very windy and cold and, while our target was obvious, it was comforting to know that a line of old fence posts would show us the way if clouds suddenly appeared. The tramp towards the summit crosses patches of water, polished hard in the freezing conditions, and we were careful to skirt round their edges where the going was much less treacherous. The path steepens as you near the top and once or twice we needed to use our hands as we cracked our way upwards through the crunchy snow. We settled into the the semi-circular drystane shelter erected just a short distance away from the summit trig point to have our lunch and listened to the eerie whining of the wind as it reverberated through the metal pylons. Fresh footprints indicated that we hadn't been the only souls on Mount Blair that day but this other person had clearly climbed to the summit from the south instead of our approach from the east. The biting wind meant we didn't linger, our stay just long enough to grab some shots with the camera, before making our descent by skirting around in front of the tower to take in the view to the south which extended to the sea in the distance. After a short walk we turned north east to intercept the path we had taken towards the summit and dark clouds over Glenshee indicated the weather was indeed turning. Picking up the pace, we surprised a few mountain hares as we jogged along the track to the cairn on the outlying top. The first flakes of snow were beginning to fall as we reached the top of Corrie Vanoch and the conditions meant that it would have been unwise to attempt to reverse our original line of ascent and instead we followed the well-trodden path to the car park which adds a bit of distance but is nowhere near as steep. Distance 3-4 miles/5-6.5km depending on route taken. Start/parking Small car park just off the B951 (grid ref NO 185633). Grading The choice of a steep scramble if you opt for a direct ascent of Corrie Vanoch, or a leisurely stroll if you follow the path to the south of the coire. A fine summer evening's stroll suitable for all ages and abilities. A good choice of hill for an introduction to winter walking (it took us less than two hours to complete and we're no athletes! ).